Since I am only using "my half" of the garage, there are space limitations. Up until now I have kept all of the unused wing parts in the original 3x6 crate that I got from Van's when the wings were delivered. Now that I have to store one of the wings to start on the other, I NEED MORE SPACE! So decided to add a lower section to the wing cradle to hold the wing parts and get rid of the 3x6 crate from Van's. Here I have removed one of the angle 2x4 braces and replaced it with a vertical brace, using some of these neat tin attachment thingies (that's a technical term), which I got from Home Depot. I had to remove the original 45 degree angle to allow room for the wing skins to lay flat on the lower section. I put a 2x4 on each side of the exising wing dolly for the plywood to screw into. They are the same length as the center beam. I had use my power miter saw to cut off a little of the 2x4 on each end to make it fit nicely. I bought some 3/8" CD plywood at Home Depot and had them pre-cut it 36 inches wide. I notched out for the 2x4 braces on each end with my jigsaw. Then I screwed the plywood down with 1 1/4" wood screws. The 12 inch wide scrap piece of plywood that was left over from the pre-cut at Home Depot, fit the other end perfectly. All I had to do was cut it off 36" long. The Force is with me young Paduwon. I screwed that into place as well. I wanted to keep my plane parts from rolling off the plywood, so I screwed two side rails that stick up above the plywood. Works pretty damn good, if I do say so (and I do!). I called out my kiddo and we did a demolition derby on the old Van's 3x6 crate and hauled it off (I did save some of the wood, ya' never know). Oh yeah, I worked on the RV too! 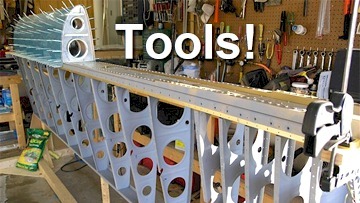 I final drilled all of the holes in the spars and ribs and primed the ribs in the right wing. When I get everything riveted together, the whole thing will go on the wing jig after I relocate the left wing on to the new wing cradle.